It’s funny, the things moving teaches you about yourself. Particularly big, trans-global moves – like the two we’ve done in the last year – are as much about the journey of self-discovery as they are about the journey of things. I now know, for example, exactly which of my material possessions are important to me, since paying by the cubic millimeter to retain possession of them – twice – forces you to figure that out fast. I also have a heightened appreciation of the shades of gray between what I can and cannot live without. Like, I now know that I can live without a microwave but I cannot live without a set of handheld beaters, and that I prefer not to live without a salad spinner but that’s considerably more preferable to life without a dishwasher. And as for those little dwarf-sized fridges that I happily waved goodbye to when we left Europe, it seems I’ll force my husband to drive two hours to pick up a fridge I bought on ebay rather than live with one of those again, even if it was provided free with our apartment. But that’s not being unreasonable, is it? What took me most by surprise, though, was what I found myself doing once installed in each new locale, even before the boxes were unpacked and the new furniture arranged. In both cases I turned on the oven and started baking – which, it would seem, is the only way I can even begin to call a new place home. To be fair, I often go through baking phases, but a) they rarely happen in summer, since who wants to heat up the whole house when it’s already hot? and b) a baking phase for me is two or three new things, spread out over a month or so. But when I think back to last year and the first few weeks in our cottage, my memory of what it felt like to actually settle in to life in the U.S. is completely obscured by memories of cookies, muffins, and the first scones I’d baked in, like, a decade. At the time it didn’t seem that strange – I probably told myself I was just getting to know our new oven, or trying to win over our new landlords with edible gifts, or even reconnecting with my western homesteading roots, but in retrospect I’m pretty sure there was something else going on – something psychological. The reason I’ve come to that conclusion is because that’s exactly what I’ve been doing here in Germany. There is definitely something about baking that evokes the feelings of security and comfort we associate with home. I’ve heard stories of real estate agents who pop a tray of cookies in the oven before showing a house – and even, believe it or not, of companies marketing cookie-aroma-in-a-can for time-pressed agents to simply spray around the kitchen. People, apparently, go nuts for it – somehow smelling these things in the air brings up such strong associations for people that they perceive a space not as an unfamiliar assembly of walls and floors and furniture, but as someplace they might actually want to live. It’s as if the aromas of butter and vanilla and yeast tell that part of the brain that for the sake of our own survival keeps us on alert in unfamiliar surroundings, it’s okay, you can relax now – you’re home. In my case it certainly seems to work, as I’m feeling much more at home here than I was six weeks, five cakes and two tarts ago. Actually it might be four cakes and three tarts – I’m not quite sure. The thing is that one of the best things to come out of my oven is a funny sort of hybrid – it’s made like a cake, looks like a tart, and tastes like a cross between both with a little bit of a clafoutis thrown in for good measure. The original recipe comes from the late Richard Sax’s wonderful book Classic Home Desserts – which, I’ve just decided, shall henceforth be known as my ‘moving bible’ – in which it’s presented as a wonderfully easy, unleavened apple cake you bake in a pie pan. He says “stick a bookmark here, since that’s how much you’ll make this”, and I have to agree. It’s deceptively simple; apart from browning the butter everything can be done in one bowl, which, when bowls are in short supply because all your belongings are stuck in customs indefinitely thanks to the fact that the agent handling your shipment unexpectedly went on vacation, is pretty nifty. But the main reason to love it is because it’s good, really good: crusty, buttery, tangy and sweet. And of course, a fringe benefit is that it’ll make your house smell wonderful, which in turn will make you feel happy and cozy and safe. Of course, you could just buy some apple cake spray, but I assure you, the real thing is so much better. This recipe started life as Ligita’s Quick Apple Cake, which is a classic recipe in itself. As things tend to do in my kitchen, however, this evolved, and now it’s a close relative of Ligita’s cake, but definitely its own dessert. For one, I bake it in a shallow tart pan, which allows for maximum crustiness and a somewhat lighter texture. I’ve also taken out the cinnamon, which I felt was masking the delicate flavor of the browned butter, and replaced it with a vanilla bean, since vanilla bean sauteed in brown butter is one of the best things ever, trust me. The result is something really unique, like I said, a cross between a cake and a tart, crisp and soft, buttery, fragrant and fruity. And trust me again, you will want some whipped cream or ice cream alongside. Preheat the oven to 350F/175C. Generously butter an 11-inch (28cm) nonreactive tart pan or other similarly-sized glass or ceramic baking dish. Toss the apples in a bowl with the lemon juice and 2 tablespoons of the sugar. Spread the apples evenly in the prepared pan. Combine the butter and vanilla bean in a small saucepan (not nonstick – you need to be able to see the butter change color). Cook the butter over medium until the milk solids are light brown and the whole thing smells deeply nutty, about 7-10 minutes. Watch carefully to avoid burning. Allow to cool for a few minutes, then remove the vanilla bean (add it to your extract!) and pour the browned butter into a medium-sized bowl, scraping the black vanilla seeds and browned butter solids in too. Stir the 3/4 cup (150g) sugar into the butter. Gently stir in the eggs; stir in the flour and salt just until blended. Spoon the batter evenly over the apples and spread into an even layer. Sprinkle with the remaining 1 tablespoon sugar. Bake until lightly golden and crusty, 30 to 40 minutes, or until a toothpick inserted in the center comes out clean. Cool in the pan on a wire rack. Cut into wedges and serve from the pan warm, with whipped cream or vanilla ice cream. I had things all worked out last night. I was going to make an Apple cobbler…with a scone topping as the biscuits. Now all that’s changed….brown butter, vanilla, what can I say. Thanks Melissa and I can see you’re settling in very well! Love that Richard Sax cookbook! Your changes look divine. Off to check if my tart pan is 11 inches – if not I’ll just have to use a pie pan. No way. When I saw the photo and title I thought "this sounds like Ligita’s Quick Apple Cake" from Richard Sax.. it was bookmarked for years before I actually made it! I’ve now done it with peaches and plums, but this made me realize I’ve still not made it with apples. Isn’t it fantastic? So easy, and I think I’d choose it over a pie. I go through baking phases too – and every fall I am obsessed with the idea of baking apple cakes. I’m going to have to make me one of these babies, and slather it with whipped cream. Thanks! This cake sounds great and so easy! Too bad I don’t have an oven to try it – I just moved as well! I’ll bookmark it, waiting for a better day… You know it is funny – I was reading your blog while you were in Edinburgh before I moved to the UK, and kind of used it to figure out how things were down there. Then you moved to Seattle and I moved in the Uk – and now we are both in Germany! Let us know what nice food you manage to get please!Caterina, those are some crazy coincidences! How are you liking Germany? What part are you in? I’m still feeling my way around food-wise, but one thing I’m loving is my thrice-weekly local farmer’s market. Compared to the once-a-week offerings in both Edinburgh and Seattle, this is heaven! There is nothing more delicious than a food made at home with love and compassion! I suddenly missed my mom who always cooks and bakes for me! This cake looks delicious! I am about to make it, but the only thing that struck me as odd is the lack of leavening in the recipe-I am still going to make it, but I am curious to see how it turns out. As always, this is a beautiful post! I love your blog. You inspire me to cook. I totally get making baking a first priority after moving into a new home. Both when I lived in Taiwan and Thailand I went out and bought myself a tiny oven (homes there come without) to start baking as soon as I’ve moved in. Lovely blog here, really enjoy your writing style. I’m not much of a baker, but this recipe looks so delicious I’ll have to give it a try. I loved your comments about how moving forced you evaluate what things are important to you. It’s easy to get bogged down with too much meaningless stuff that you overlook until you’re faced with moving it. You’ve inspired me to do some de-cluttering even though I’m staying put. Great post! I made this cake with the windfall of apples from my boyfriend’s parent’s garden-it is WONDERFUL! 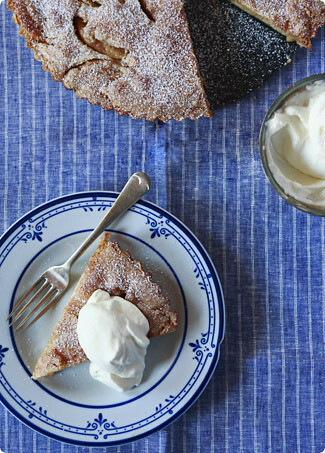 Sort of like an upside-down tart, but quicker. I made this one cranky morning with one apple (and the other ingredients scaled). It was amazing. Needless to say, I felt much better after. I agree that baking is truly a cozy, comforting thing. Wow! I made this for dessert tonight. My only problem was that I used a tart pan with a removable bottom and apple juices dripped all over the bottom of the oven. But it’s so good! Totally worth it! Next time I will use a regular pie plate. Thanks for the great recipe. Thanks for the recipe, Melissa–my almost 3 year old son and I love this recipe and have already made it twice. The brown butter-vanilla combo is brilliant! This is was I call a dessert, no messing around. I must make this as soon as possible, maybe I will make it with pears and cranberries, that sounds yummy. Oh wow, I am overwhelmed by the possibilities, but oh-so excited. I am glad you’re baking especially if it means giving me recipes for treats like this one. I made this cake (http://cookingupaphd.wordpress.com/2009/12/13/apple-cake-two-ways/#more-290) and it was amazing. The people in my office loved it. Thanks so much for the recipe. I made this for Christmas. It was very easy, and it was delicious. I plan to make it again tonight for New Year’s Eve! My goodness! That cake… takes the cake (pun intended), and it even made me drool just by the looks of it! Man, this made me remember one gift that my girlfriend has given me when I moved to a new place in Indianapolis, IN, then all of my friends helped me move all the furniture, and after all that was done, she has given me a strawberry cheesecake that she knows that I love, and we both ate it at the patio while the others are drinking beer. This is delicious! I've baked it twice now and it got better the second time around, which I made for a group. I prefer a semi-tart apple (used empires) because the granny smith was too tart for me. Also, as another reviewer said before, a tart pan with a removable bottom will drip but still taste amazing. Second time around, I baked in pie plate (both times in 9 in.). This recipe is definitely a keeper! Thanks so much.